Tennis Elbow: Treatment and Prevention to Keep you Making Gains! Having suffered from tennis elbow ourselves, we know how frustrating it can be as it can prevent you from doing many of the things you love in life. Tennis elbow is a common and often painful injury where pain is experienced on the outside of your elbow joint. Simple day-to-day activities such as typing on your computer or picking up the kettle can become painful to the point where they become impossible. You’ll most likely be wondering how you’ll ever train again when you can’t even do simple day-to-day tasks without suffering discomfort and pain. Do not fear — you can get back to training faster than you think provided you understand the basics of tennis elbow. So here’s how to check if you’ve got tennis elbow — and more importantly how to treat it and prevent it from happening next time round. Tennis elbow is a condition that causes pain around the outside of your elbow resulting in limited, and sometimes painful, movement about the joint. It is also possible for this pain to extend beyond the elbow towards your forearm and the back of your hand. Most people will feel a varied level of discomfort, ranging from mild pain whilst using your elbow, to a severe pain that can be felt even when your elbow isn’t being used. Your elbow joint is surrounded by muscles and connective tissue that control movement in your forearm, wrist and hand; tennis elbow is an overuse, or over stretching, of these muscles which results in inflammation around the joint. You may be wondering if you can get tennis elbow from activities other than tennis. Well you’d be right in thinking you can — only five out of 100 people develop tennis elbow from racket sports! Playing racket sports such as squash, badminton or tennis (duh!). Repetitive manual labour such as painting, plumbing or bricklaying. Prolonged periods of desk work typing on a keyboard. Repetitive fine hand movements such as using your mobile phone. Excessive training in the gym, especially overhead tricep movements, bicep curls and heavy gripping exercises. It is also possible to develop tennis elbow through trauma such as direct blows to the epicondyle (the bony lump at your elbow), a sudden pull, or a forceful extension, which has been shown to be the cause of more than half of all tennis elbow injuries. Unfortunately, an episode of tennis elbow can last a long time – usually between six months and two years. However, the majority of people (90%) will make a full recovery within a year. The injury is known as a self-limiting injury which means that it will eventually get better without treatment; however there are several treatments that can help to speed up your recovery. Rest – stop doing the activities that cause you problems. Allow your injury time to rest and recover. Ice – use a cold compress or even a bag of frozen peas wrapped in a towel. 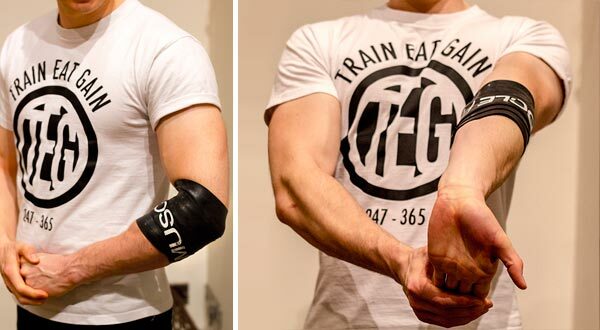 Wrap this against your injured elbow for a few minutes several times a day. Compression – compression garments, such as a tennis elbow brace or Muscle Floss, are widely available and evidence suggests their use may well speed up recovery. Physiotherapy – this may be recommended in more severe and persistent cases. Massaging and manipulating the affected area may also help to relieve pain and stiffness. 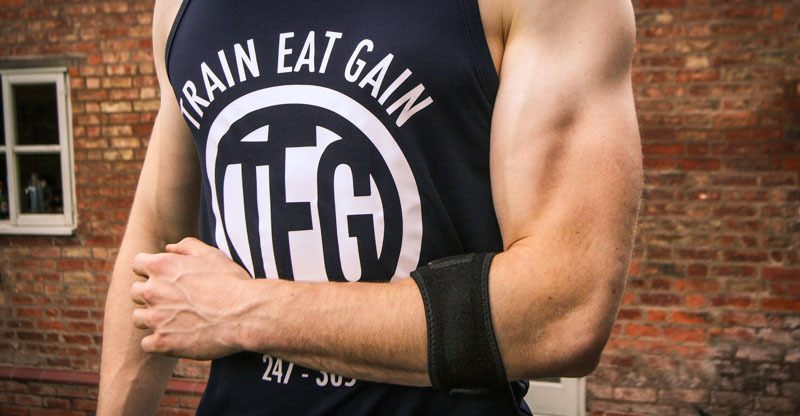 This is probably what you’ve all come here to find out — how to get back to training ASAP so you don’t lose those all important gains. I’m going to outline the approach I found to be most effective. I tried out a number of things, not all of which I found to be effective, so here’s how to skip the learning curve and jump to the front of the queue for recovery. Find out what caused it. 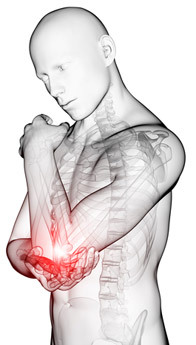 Take a look at the list of tennis elbow causes above and work out what’s the direct cause. For me it was 14+ hours a day typing on a computer combined with a lot of time spent in the gym. Limit the activity that caused it. This is easier said than done. I had to reduce the time I spent on my business, and even worse, I had to take a break from training upper body in the gym for 6 weeks! However, my legs still worked so I just focused on them instead with some brutal German Volume Training workouts! You have to remember that your gains are more permanent than you think as your body has muscle memory — I got my upper body strength and size back in about 4 weeks! Apply Heat. Initially you want to ice the injury, but after the initial recovery phase you should progress to using heat to encourage blood flow into the area for recovery (and it feels good too). I bought a couple of hot and cold packs and an ice pack sleeve (only about £8 total – you’ve gotta love Amazon!). Reintroduce the activity that caused it slowly. The temptation is to go back to it all guns blazing as soon as you start feeling better. If you want to keep recovering then you really want to reintroduce the activities that caused it very slowly. For me this meant training just twice a week, avoiding all painful exercises, and only a few hours a day on the computer with regular breaks. Use straps. Any exercise that tests your grip can really aggravate tennis elbow, so I used straps for any form of deadlift, lat pulldown or row (basically don’t forget your straps on back day!). Flossing. This was the final piece of the puzzle that really helped me reintroduce the activities I wanted to do, but which initially caused pain in the elbow. I used the Muscle Floss I mentioned earlier, and flossed every couple of hours or so when I was doing computer work, plus also at the start and end of every gym session. As with any injury, it is always better to prevent the injury in the first place, rather than find a cure once it has happened. In most cases of injury, tennis elbow is prevented through both experience and correct technique in your given sport or activity. It is important for you to understand what situations, movements or exercises cause your injury and limit these where possible. Limit your playing time if you are already injured or are feeling pain on the outside of your elbow. Strengthen the muscles in your forearm, upper arm and upper back. Increased muscular strength increases the stability of your joints. Like any activity, ensure the equipment that you use is appropriate to your height, ability, body type and muscular strength. 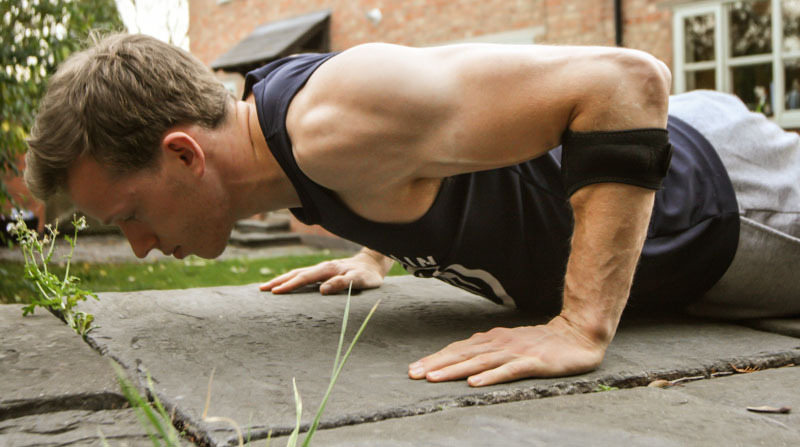 Ensure that you conduct an appropriate warm-up. Tennis elbow can be extremely frustrating and limiting in many everyday activities that you most likely take for granted. Although attempts to prevent this injury may not provide any guarantee it is important to follow the simple advice given here to limit the chance of injury as much as possible.